Over the past couple of years, I’ve been working on the best practices for running campaigns on Google+ and how, as Chris Brogan would say, we can make our buyers the hero of the story. Google+ campaigns are a great way of building trust and relationships with the people who may well become your brand advocates. Campaigns create movements. If you want to be a movement maker, then keep reading. Why think in terms of campaigns on Google+? When you run a campaign on Google+ you create a tribe, a movement, a circle of people all connected and relating for the duration. Most of the campaigns I run will tend to be one day long, but sometimes they will extend over a week. It is a great way to bring people together for a cause, or to promote a product. Google+ is a global, open network; as such people value openness, transparency and disclosure. Check out this article if you want to see more on this. Be open, be transparent, and people will engage and over time trust you and your brand. It takes time to build trust, and the more you have paid your dues to your community, the more you will find people will follow. Now, here is my disclosure: I was not paid by any of the campaigns featured in this article. 3. Because I value the relationship with each of every person who is involved, including those I helped promote. In order to make campaigns work for you, you will have to invest in building your network and in finding a community who love what you do. If you try to do this too soon, it will most likely to be a flop. Also, there are stages I have found to planning and delivering upon for a campaign and once you are ready, you may well like to move in that direction. In recent days, I tend to refer to campaigns as “Quests” – people seem to connect well with the concept. 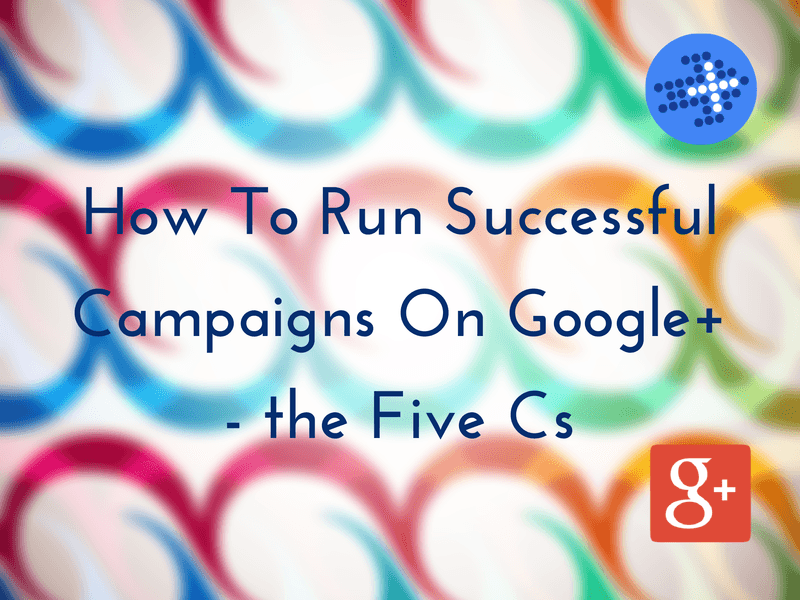 The first thing to figure out is this: What are you seeking to achieve through running a campaign on Google+? Social on Google+ leading into key Search results. We will mainly be covering the process and examples of the first two in this article, but for the results of the third, simply search for “What is Google?” and you’ll see what can be done. Once you decide your final goal, you can start the campaign planning process. This is the name of the campaign, including the hashtag and the whole kit and caboodle behind what is going to happen. At this stage, you will want to think of the assets you will create, including images, videos, and blog posts that will help people connect to the campaign. The more time, effort, and energy you put into creating really cool content, the more likely people will engage. The process I use for campaigns is somewhat old school and reminiscent of the days prior to Google+ Communities. I use Google Circles. Why? Well, I want to build a notify list to send more information on the Quest to the people who’ve opted in, and with Google Circles you can do just that. This is a dream for the Permission Marketer, a mindset for which I will always be grateful to Seth Godin for instilling in me. I have found that campaigns which involve people are the best. People love to feel part of something and as I said from the start, you are building a mini-tribe for the duration. As such, think of ways that you can make it about them. Send a private message to the circle as to the full nature of the quest, as well as any other communication you may have along the way. Important tip: When you ask people permission, also tell them how many times over what period you expect you will send them an email. Create a Google Hangout (or two) and invite the circle of people to join. This can be done as a text and image chat and/or as a video call. I tend to have a circle size of 100 people, but sometimes the Quests may be as large as 250 people in the circle (they then can ripple out to thousands from that initial seeding group). Having a control room will allow you to have real-time interactions and help people feel a part of it all. Now you have everything set up for the launch. When you are ready to rock n’ roll, you can create your first post of the campaign on Google+. Important tip: Make sure you notify your new community of people (having told them you would in earlier communication) in order to best seed that initial post. All being well, it will land in people’s inbox as well as a Google+ notification. You can do this by sharing “public”, choosing the circle (or circles) you want to share with, and then checking the “notify by email” box. Now you will be in full flow of the campaign. The more you have included people in the process, the more they will delighted to receive your interactions and contribute their own content as well. Really, I’ll say it again – Make it about them. Now, here is the thing: You are not really in control once things get rolling. You can adjust course a little, but most of what happens will have been generated in the set up. If you chose a hashtag that could be changed and one letter later you have a rude word, guess what? Within the hour someone will have started a counter campaign, a campaign of their own, and they may well find a tribe to share it. Think of it like surfing – you’ve chosen the say, the waves are there, and you just surf as well as you can. The good news is that you may well have some very pleasant surprises when you trust your campaign members to let loose and be creative. At Plus Your Business, we work with the Social Network Analysis team at Nod3x.com to track the spread of the campaign. This gives us information including the number of people engaged, the reshare rate, and key influencers. From those statistics, we can work out how long it takes to create a trending topic and how many people you would need to get involved to make an impact. Let me take you through a few case studies and the reports for each one to illustrate how this works. Teaming up with Guy Kawasaki and Peg Fitzpatrick to do a promotional event is always fun. This campaign was set up to help them promote canva.com, for which they both work. We set up two teams of people who created images using Canva.com. Then, people then went through an educational learning experience to find out which images and content seemed to get the most engagement. We capped the event with a Hangout-on-Air with Guy and Peg the next day and featured many of the participants images. As you can see from the image below, #CanvaQuest trended for most of the day. To celebrate the launch of Chris Brogan’s new book, ‘The Freaks Shall Inherit the Earth,” we went on a #FreakQuest! To celebrate our love of Rubik’s Cube (which happens to be 40 years old this year), we created #RubikTuesday. In essence, we all shared cool content around the cube and its role in our lives. As you can see above, it was great when the man himself – Erno Rubik – also engaged around the day. Finally, here is an example of a campaign I supported Google on. I got involved with it about 24 hours before they were to hit the deadline. They have been very supportive of the approach I’ve taken. I helped build a circle, a mini-tribe, bringing people together for a cause to which they relate, all while making it fun (people love fun) – just like the way I described in this article. On this occasion, I also gave people a badge (that robot chap below) that they can display on their website using commoogle.com (an engagement tool I created as a way to give badges to people in your Google circles). Campaigns are not easy to run. They take serious planning and a tribe of people to make them work. But once you have managed to build your network they will become a lot easier and, as you can see, the results can be superb.